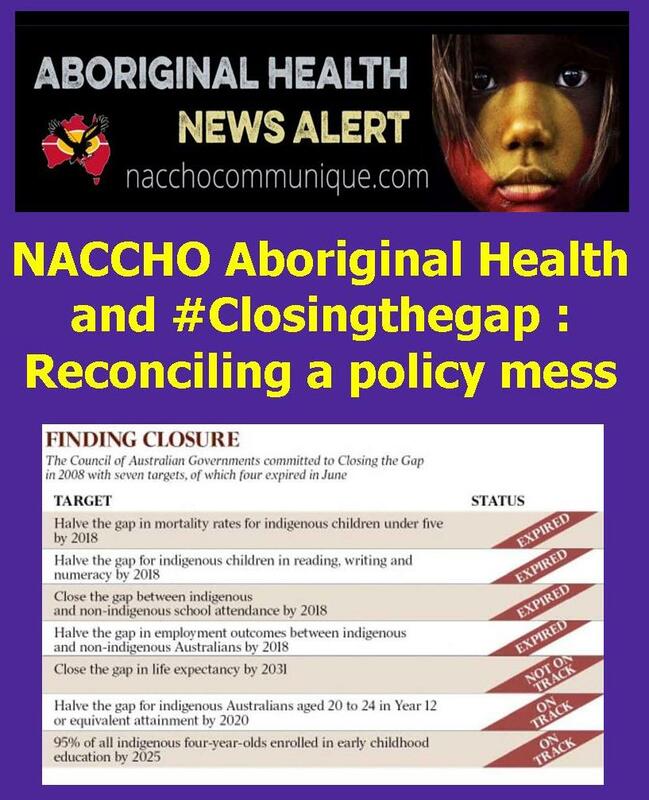 NACCHO Aboriginal Health and #Closingthegap : Reconciling a policy mess : But research shows ACCHO’s significantly more effective at improving Indigenous health outcomes than the mainstream system. ” The present National Aboriginal Community Controlled Health Organisation (NACCHO )network provides a different working model for governments devolving decision-making power to the people directly affected. Research shows the network is significantly more effective at improving indigenous health outcomes than the mainstream system. To get to the bottom of why the decade-old Closing the Gap program designed to reduce Aboriginal and Torres Strait Islander disadvantage has been such an underwhelming enterprise, it helps to trawl through the confused muddle of a half-century of indigenous affairs policy in Australia. The Council of Australian Governments scheme, with its range of targets tracking outcomes across health, education and employment based on rigorous data sets, emerged in Kevin Rudd’s hands from the formal reconciliation era to become an annual showpiece addressing the state of the First Nations within the broader nation. That this concept was even possible dates to 1967, when a referendum gave the commonwealth powers to join with state and territory governments to create a national system of indigenous affairs. For the first time, indigenous Australians could be treated — in theory — the same as everyone. But theory and practice often don’t align. The fact Closing the Gap now is undergoing a root-and-branch review, labelled a “refresh”, shows this. So does the Turnbull government’s malign rejection last year of the Uluru Statement from the Heart’s proposal for indigenous constitutional recognition, which would have put indigenous Australians at the heart of policy made about them. Now the latest top-down spasm in indigenous affairs policy, the appointment of Tony Abbott to an ill-defined role as “special envoy” in the field, is being seen in many quarters as yet another abrogation of repeated government promises to do things “with, not to” Aborigines and Torres Strait Islanders. Academic Marcia Langton has called the appointment a “punch in the guts to indigenous Australia”, and it has been described by others as being more about solving Scott Morrison’s political problems than black Australia’s lived ones. The Prime Minister’s indigenous advisory council was not even consulted, co-chairman Roy Ah See revealed to The Australian. There are just three Closing the Gap targets still formally being considered, only two of them on track: halving the gap on Year 12 attainment and getting 95 per cent of four-year-olds enrolled in early childhood education. The third, closing the gap on life expectancy by 2031, remains derailed. Four more targets expired recently. Just one — halving the child mortality rate — is trending to be met, although data experts query whether the underlying figures used to demonstrate this are accurate. The other three still off course when their timelines ran out were on reading, writing and numeracy; school attendance; and employment. The Australian Institute of Health and Welfare charts a life expectancy gap of 10 years and says that between one-third and one-half of the health gaps between indigenous and non-indigenous Australians are associated with differences in socio-economic position such as education, employment and income. Linked to this, it recently released a report documenting the ongoing impact of trauma suffered by the Stolen Generations, of whom it calculates there are 17,150 survivors. Many of the detailed written submissions to the official government “refresh” point out that structural reform is the only thing capable of overcoming the inequity born of more than two centuries of dispossession and trauma. Not a blind adherence to meeting targets — or, as expressed in ­Abbott’s acceptance of his new role, the rather hollow platitude that improved school attendance rates “is the absolute key to a better future for indigenous kids and this is the key to reconciliation”. The overwhelming conclusion is that long-term failure has been the result of a lack of consistent indigenous voices in policymaking — and although peak groups and individuals are being consulted on the “refresh”, there is not much expectation of ongoing co-design. After a series of workshops involving peak groups and individuals, there are 23 revised targets on the table. Several continue on the original themes, ­although the reliance on a mix of state and territory data and policies, as well as those at the commonwealth level, is a reminder that the 1967 referendum’s unanticipated result was an overall indigenous affairs policy incoherence. Measures on health, education and employment take up the first nine proposed targets, with existing data on each of these assessed to be largely adequate for integrating into a revised scheme. A new category of entrepreneurship acknowledges that getting out of poverty is crucial to escaping disadvantage, but analyst Charles Jacobs, from the Centre for Independent Studies, warns that its reliance wholly on government procurement spending increases could mask the need for also boosting indigenous business participation in the private sector. Areas such as housing, child protection, justice and family violence also are categorised as having sufficient data streams to create realistic targets, but the worry is that measuring inequitable rates of out-of-home care and imprisonment could be meaningless at the commonwealth level if the state and territory jurisdictions that determine them do not also introduce actual policy change. The remaining areas being considered in the current blueprint cover targets that may address some of the root causes of this, but for which the review’s briefing notes admit there is no useful data being collected. This raises the question of whether measurability on these should even be the key goal or whether the voice to parliament proposed at Uluru might be a better lever because it could have a direct influence on policymaking. They include disability and social inclusion, culture and language, racism and systemic discrimination, healing and trauma: issues that inquiry after inquiry has acknowledged are influencers of overall poor indigenous outcomes. The First Peoples Disability Network submission to the review describes the flaws as being built in to the system. There is even speculation that the 11th report, due in February, simply will be an announcement of a new measurement regime for the revised series of targets, thereby avoiding the dismal recitation in recent years of failure. There is a further fly in the ointment, though: an Australian National Audit Office inquiry also is under way, investigating whether appropriate data governance arrange­ments are in place for estab­lishing progress in the official program and whether there is effec­tive evaluation of what impact indigenous programs are having. That audit is due in February, right when the annual Prime Minister’s report lobs. The outcome could be a jarring crossover, as the Auditor-General, a statutory official, is under no pressure to make the government look good. Richard Weston, chief executive of the Healing Foundation, which came into being after the 1997 Bringing Them Home report identified unresolved trauma as a key driver of continuing indigenous family and community dysfunction, says the “huge economic cost to the Australian taxpayer of only addressing symptoms of trauma” is just one of the issues at stake in whether Closing the Gap works. His foundation’s submission to the government review is damning. “Empirical evaluation designs that seek to prove a statistically significant impact on Aboriginal and Torres Strait Islander wellbeing are failing to shed light on what elements of the program failed, why they failed or how they could have succeeded, and have not given recognition to those considered effective in the eyes of the people who deliver or engage with the services,” it reads. Which is where going back to the 1967 referendum outcome is helpful. A Productivity Commission report last year said 44 per cent of the $33.4 billion allocated to indigenous spending annually came via the commonwealth, a direct result of that vote. Of this total, $27.4bn (or 88 per cent) was channelled through mainstream services available to all Australians, such as health, ­policing and education. The remaining $6bn came through indigenous-specific programs and, of this, the Department of Prime Minister and Cabinet administered almost $2bn, but the whole often is delivered via a spaghetti bowl of overlapping service and program providers, with ­inade­quate evaluation of effici­ency or results and frequent shifts in policy. One example of this was the implementation in 2014 of an overarching Indigenous Advancement Strategy federal funding model, an approach broadly canned by a later Senate inquiry for its poor design and implementation and that stripped $500 million from the field. This all raises the question of whether the commonwealth should be providing programs at all or, as University of Queensland professor Mark Moran puts it, deciding to “fix a failing public ­administration system”. “This could include innovations in new funding methods, with collaboration and accountability measures that wrap and build around the discrete place or dispersed urban population, instead of targeting individual recipients with more grants,” Moran says. “Mainstream services — such as education, school, health, police and child protection — are essential and must remain. It’s what the Uluru Statement’s framers say the voice to parliament is designed to address, with very likely a regional, traditional owner-based network feeding up to a national body but directing it towards locally determined needs. So, too, is the Empowered Communities model, being trialled in nine discrete indigenous communities nationwide including in Sydney’s Redfern and La Perouse, or Cape York’s Pama Futures approach, a collaboration between local people and governments that its advocates describe as “the best chance we have to close the gap on indigenous disparity in our region”. There has not been a national approach to inviting representative indigenous input to policy since the Howard government dissolved the Aboriginal and Torres Strait Islander Commission in 2004, and even Amanda Vanstone, the minister at the time, said recently that “in hindsight (it) might have been a mistake” to abolish that body in its entirety. Law professor Megan Davis, pro vice-chancellor indigenous at the University of NSW (and one of the authors, with Cape York lawyer Noel Pearson, of the Uluru Statement), says a key feature of ATSIC was its impact on regional policymaking, in particular the provision of remote infrastructure and the importance of this to closing the gap on indigenous disadvantage. Before ATSIC, bodies such as the National Aboriginal Conference, established by the Fraser government in 1977, exploited what then minister Fred Chaney has recently described as a “loud and often critical voice” that was nonetheless “useful and effective” in determining the needs of indigenous Australia. Post-ATSIC, the National Congress of Australia’s First Peoples was an attempt at providing a representative voice but it lost all funding with the introduction of the Indigenous Advancement Strategy. But perhaps Gumatj clan leader Djawa Yunupingu put it best when he asked in a fiery and, as it turns out, prescient speech recently at the annual Garma festival in Arnhem Land, the same forum Abbott used in 2013 to declare he would be a “prime minister for indigenous affairs” should he win office. “How long do we have to wait to get this right?” Yunupingu said. “Another committee? Another meeting? Another prime minister?